KABUL, Afghanistan — Once again, it’s time to get to work. Photographer Colin Kelly and I arrived here in Afghanistan this morning on overnight flight from Istanbul, eventually making our way over to the military side of Kabul International Airport. It’s one of the main camps here for the International Security Assistance Force overseeing the war, but it also serves as a transit trip for folks like us, who are heading farther out into the war zone. This marks the third trip for both Colin and I. We had a laugh this morning discussing how nervous we both were on our respective first trips through the airport here, as we got our bearings and tried to figure out (with some paranoia, perhaps) whether anything posed us a threat. We still take plenty of security precautions, but it’s safe to say the act of landing here and finding a ride to the ISAF side of the base no longer spikes the blood pressure. 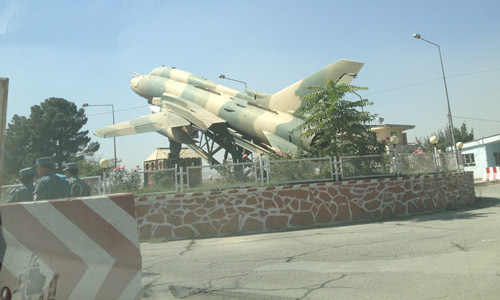 On the way to the camp, Colin snapped this photograph of a jet fighter monument at the airport. It’s actually a pretty imposing sight as you make your way to and from the terminals. As advertised, we’ll obviously have much more on this blog in coming days. Please stay tuned. Thank you for providing this blog! I have a son in the sandbox and look forward to hearing about what is going on over there. I was chatting with him on facebook today, which makes a Marine Mom very happy 🙂 I don’t hear from him often, so a fast chat eases my anxiety. Stay safe and know you are very much appreciated! Ooh Rah!